Another small yet not insignificant step toward the dissolution of that grand creation of a now long dead empire: the Republic of Iraq. The President of the Kurdistan Regional Government Massoud Barzani today withdrew (in Arabic here) all Kurdish ministers from the cabinet of Iraq’s central government headed by Prime Minister Nuri al-Maliki in Baghdad. This comes a day after Maliki accused the Kurdish regional government of harboring terrorists from the Islamic State in its domains. Turnarounds are always possible, but Iraq seems unlikely to keep on existing in the form we have known it. I suppose that Iran could throw an immense weight of forces into fighting the Islamic State in both Syria and Iraq and make a supreme national effort to destroy the wannabe caliphate led by its remarkably uncharismatic khalifa before it gets a real head of steam going. Possible, always possible but unlikely. Or Russia could decide that they don’t want a jihadi empire rising up to their south and decide to give serious backing to Maliki, but after his lightning annexation of Crimea Vladimir Putin no longer seems able to get out of his own way in Ukraine so I would be dubious on that. Or there could always be a good old fashioned divine miracle, but one really does wonder at this point why the Lord of history would be interested in saving the Iraq that we have known. In any case those things are beyond my comprehension. Today the Islamic State released footage of a man they claim to be Caliph Ibrahim, better known to the world by his nom de guerre Abu Bakr al-Baghdadi. 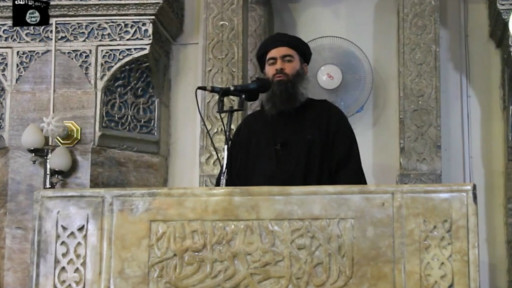 Baghdadi apparently addressed worshippers at a mosque in central Mosul and declared that he was their (والي) or custodian/leader/guardian, there isn’t really a great English translation. He also declared that while he was ‘not the best of you’ he expected to be obeyed by all Muslims if he followed Allah and advised of it if he erred though how well men like this take advice on their errors remains an open question. His declaration of a caliphate and himself as caliph has met largely with scorn and derision from across the Muslim world, but time will tell. If the Islamic State can continue to string together victories in Iraq and Syria then who knows? Muslims from around the world who are starved for leadership (a condition we Catholics can relate to, though we are looking for a far different kind of leader; stop being so enamored with this passing world priests and bishops and Holy Father and just preach the Gospel!) may flock to him. We shall see. The Iraqi state, cobbled together by the now long dead British Empire from the former Ottoman provinces of Baghdad, Basra, and Mosul in the aftermath of the First World War, appears to be coming to its end. The fruits of the 2003 American invasion are now laid bare for all to see. The gains of the Islamic State, formerly known as the Islamic State in Iraq and the Levant, over the past three weeks in the north and west of Iraq and the inability of the Baghdad government to reconquer this territory have now opened up an opportunity for the Kurds to achieve their dream, which is as old as Iraq itself, to cut off their own region from Baghdad’s control and form their own state. The president of the Kurdish regional government Massoud Barzani today asked the Kurdish parliament to form an electoral commission for the purpose of conducting an independence referendum. No date has been set but there is no doubt as to the outcome. And whenever they decide to do it this referendum will eliminate any chance of putting Iraq as it has been known to the world since the 1920s back together. What chance the Kurdish state will have in the future I cannot say; there are powers in the Middle East such as Israel who see it as some sort of buffer against the rise of the Islamic State but we shall see. Meanwhile the Islamic State is gaining strength (doubtless due to the influx of Iraqi weapons) in Syria and has taken control of large parts of the Euphrates valley. Only the Syrian government controlled town of Deir az-Zour stands between the Islamic State and its control over the whole of the Euphrates valley from Raqqa to Haditha. All of this while other Syrian rebels are saying that they will give up fighting against the Islamic State. Nothing succeeds like success, as IS is showing right now. Events are fluid in the Middle East and it has been a long time since the world has seen so much that most people take for granted across the world in such doubt across such a wide region.